Flame Writer: Buccaneer Blogfest: FINAL POST - Everyone. Is. Amazing. 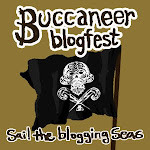 Buccaneer Blogfest: FINAL POST - Everyone. Is. Amazing. This. It was just...so amazing. You guys have no idea, absolutely none. My first actual bloghop, and it’s finally complete (three days late ;_; ). I’ve never felt such a drive to post on my blog before, and it’s because of all the amazing people who participated. Everyone had wonderful things to say on their own blogs, and every since one of them had so much kindness. It’s hard to find such kindness in the world anymore, and even if you have to find it through the internet, so be it. Look at how many followers I’ve gotten. When I started this bloghop, I had twenty-two followers. Now I have forty-six. Numbers don’t mean much, but to me, that is SOMETHING ABSOLUTELY AMAZING. I know that there are at least forty-six people out there who are curious to know what I have to say about several different things. I know there are forty-six people out there who want to know what my blog’s going to become, and I sincerely hope that each of those forty-six followers can achieve every dream and aspiration they have. They deserve it. This entire experience has just been a lot of fun. I’ve done a lot of things I never thought I could do properly (interviews, giveaways, sharing my WIP...). I’ve gotten awards from the people I’ve met, which is even more amazing. But I am sad to see it go because I’m afraid my inspiration to post will disappear along with it. Just look at how late this blog post went up! Although, I guess that’s up to me. As a blogger with forty-six amazing followers, I have to make each and every post count and I have to make sure they’re on time! I’ll cut it there. (: I thank EVERYONE who looked at my blog before, during, and after this bloghop. I thank every one of my new followers and anyone who just happened to glance at my blog. I thank Sharon Bayliss for starting up this amazing journey over the seven seas of blogging. And with that, my ship is going to break out into my own waters instead of sharing it with you guys...but hopefully, and surely, we will meet again, mateys! Aww, this is so sweet :) I think I might do this next year! I wasn't able to this time, and I wasn't really sure I wanted to, but next time, I think I might... it sounds like a ton of fun! But me and my new computer (macbook) are getting along just fine. DDD: *Hugs* It's okay! As long as your new friend is getting along fine. Same here!